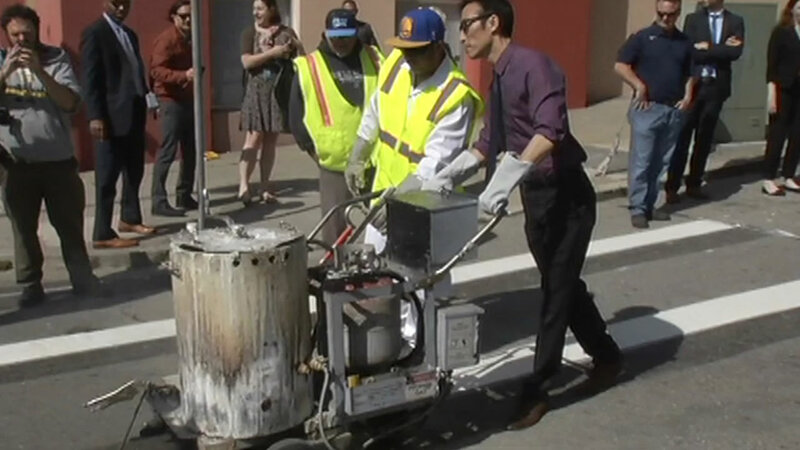 San Francisco crews repainted the crosswalk at Emerson Street and Geary Boulevard on Thursday as part of the city's campaign to eliminate traffic deaths by 2024. SAN FRANCISCO (KGO) -- Some pedestrian safety changes were made in San Francisco's Richmond district on Thursday. City crews repainted the crosswalk at Emerson Street and Geary Boulevard. It's one of many changes that are part of the city's Vision Zero campaign to eliminate all traffic deaths by 2024. It comes one day after a van hit and killed an 87-year-old man crossing the street. The Wednesday morning fatality at Geary and 26th Avenue is the first pedestrian death of the year in the city and a sobering reminder for everyone. "We don't want to call these things accidents anymore, they are preventable, we have a city that's committed," said San Francisco Mayor Ed Lee. A $500 million transportation bond is paying for the street improvements.